This is a recipe from my Great-Grandma Rees's mom. It is meant to be a breakfast cake, like a coffee cake. My grandparents used to make a bunch of these up in the fall when they had a lot of apples and freeze them for the rest of the year! Put dough in pan, then press apples into the dough. 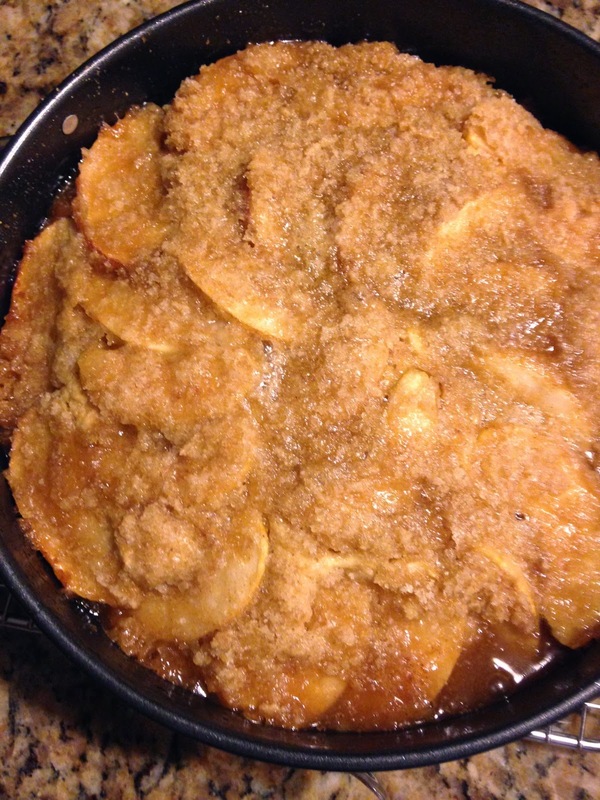 Rub sugar, flour and butter into crumbs and sprinkle on top of dough and apples. Bake slowly in a moderate oven. I have to admit, I almost broke out the old KitchenAid. But, that seemed untrue to the recipe. My guess is that my great-great-grandma didn't have a nice stand mixer. So, I went after it with nothing but a bowl and spatula. It was kind of fun. I baked mine in a cast iron skillet because I thought it seemed right. This would work in any round cake pan or 8x8 pan etc. This cake is an excellent coffee cake. The cake itself has a moist, slightly dense crumb like you'd expect from a breakfast cake. It's almost like a shortcake cake with thick batter and good rise. 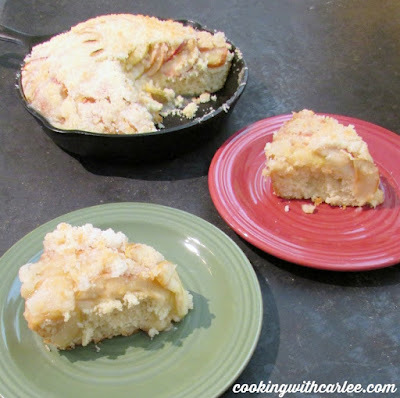 The apple retain just bit of crunch and the topping adds a little crunch as well. The contrast in texture and light flavor will have you clamoring for another slice. Plus it is fun to serve something to my little guy that is 3xgreat-grandma made. That is a lot of greats! Pour in milk and combine. Mix together flour, salt and baking powder. Fold into wet ingredients until incorporated. 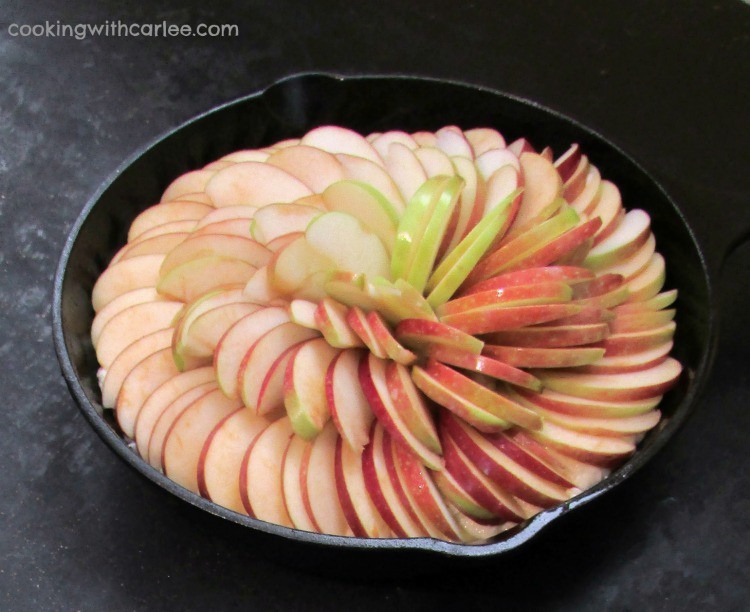 Top with apples, lightly pressing into batter. Mix sugar, flour and butter in small bowl until it is coarse and crumbly. Spread over top of apples. MiMi had to make one too when she saw I was making one! If you would like to know a little bit more about them (they led quite the interesting life) scroll down below the recipe here! Your apples look peeled. Are they? No, I didn't peel them. I thought about it, but I sliced them thin instead. I figured that way it wouldn't matter. If you put larger chunks of apple, it would be nice to peel them first. We decided that the topping would be more of a crumble topping if I had used a smaller pan. If you want to use a large pan like I did, I would recommend doubling the topping recipe or end up with a crunchy glazed topping like mine (you won't hear any complaints)! It was a lot of fun to try one of her recipes! Yum yum and more yum. I've got an apple cake up now that is one of my all time favorites. Nothing beats apple cake. Thanks for linking up at @SaucySaturdays. I will have to check it out. I love apple cakes and love trying new recipes! I have some apples from a wild tree here at Passing Wind Estates. I now know what I am going to do with them! Thanks! How lucky!! This would be perfect for homegrown apples. I would image that is how my great-great-grandma made it! Argh! I wish I'd had this recipe when my parents were visiting, my dad would love it! I might have to make it for them when I go out to Oregon next 😀 I've always heard that coffee cake is better made by hand because it results in a softer crumb, your grandma would be proud! It really is easy enough to make by hand, I had just been in the habit of pulling out the mixer so it seemed odd not too! Lately I have been loving making things by hand when possible. I hope you do make this for your dad. I always love making it as I know there is a lot of family history wrapped up in it! Spectacular!! And it's so cool it's a passed down family favorite! It's going on my list to make! Thank you! It is so much fun to bake something you know so many generations of you family have enjoyed! Love the pic of your relatives! I also love my Nana's old recipes. This looks amazing! Thank you! There is something that really makes you feel connected when you are baking old family recipes. Love anything with baked apples and the pictures of your family. Pinned and shared! Thank you so much, Quinn! What a great post...superb recipe...awesome photos. Thanks so much for sharing with us at Weekend Potluck. MMMM! Thank you so much, Marsha. You're making me blush! I love the history of this recipe! I was just going through some of my grandma's recipes the other day, and like you said, there are a few holes in them! 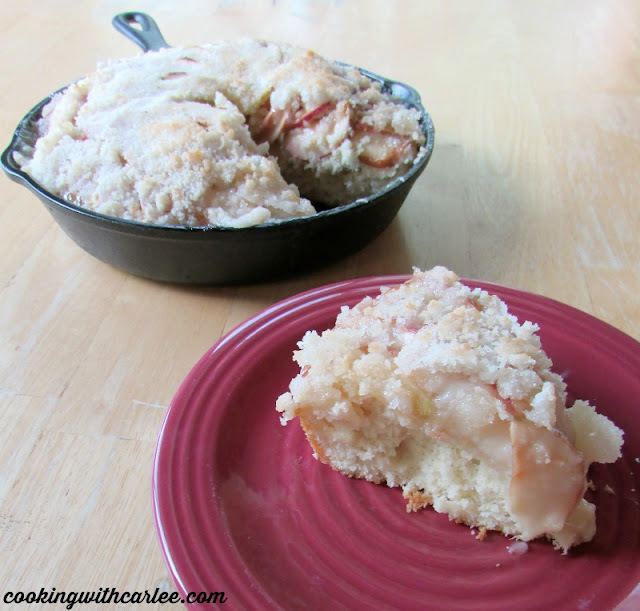 Definitely need to try your recipe once we get in a trip to the orchard! It is kind of interesting to figure out what they meant or change it to more modern instructions. I'm thinking maybe ovens in that day in age weren't quite so modern as turning the dial to 350! Yum! This looks really We have apples coming from our tree, Ill have to try making this! Thanks for sharing at Merry Monday! Visiting from www.twelveonmain.com. I am so jealous! I wish we had an apple tree. I hope you love it! Hey Carlee! Umm...YUM! This recipe looks delicious. Anything in a cast iron skillet is going to be good. Thank you for linking up at Funtastic Friday. Just seeing something in cast iron does add that little something, doesn't it? Especially a heritage recipe like this. Thank you so much! Thank you for the lovely photos and notes, including those about the history of the recipe!! I have a couple trees and have been looking for new options!! Have you ever tried adding cinnamon or nutmeg, etc as variances? Thank you, Tamara! I am really envious of your apple trees. I have tried it with a bit of spice before and it is delicious, but wanted to post it true to how my family makes it. Hi Carlee, just as I thought. Your Great-Great Grandma was also a whiz in the kitchen. I will be trying this recipe for sure. Only me again. Just made this and half of it's gone already. My daughter says it's the nicest cake she's had in a long time (thanks, daughter of mine!). I did add a grating of nutmeg to the topping, only because I like nutmeg and apple. The cake was superb, nice and homely. Can't wait to try the peach one sometime! YAAAAAAAAAAAAAAAAAAAYYYYY! I am so happy that you all enjoyed it! This is definitely a highlight of my day!! Have a super weekend, Debbie!